The secret is out! 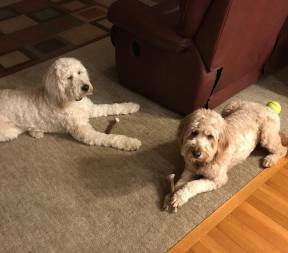 Dogs find fresh Elk Antler Chews absolutely irresistible! 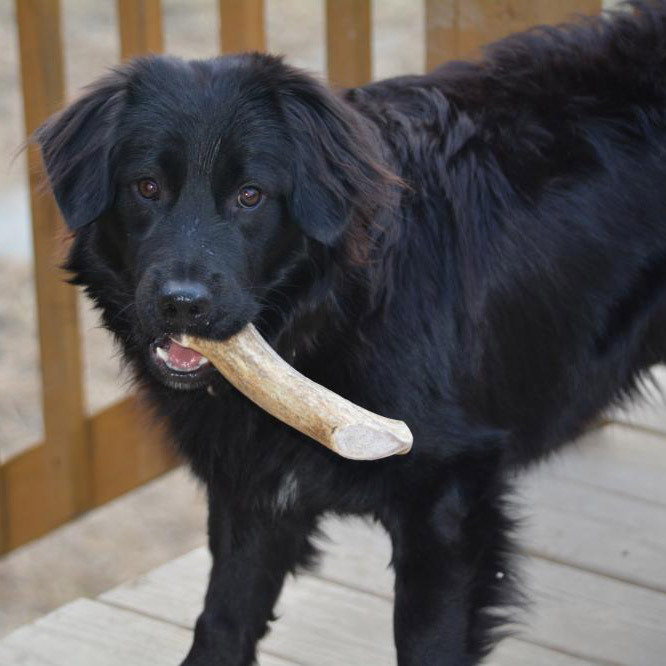 Let your Dog be a Dog, unlock his natural instincts the healthy way and order some Premium Elk Antler Chews today! 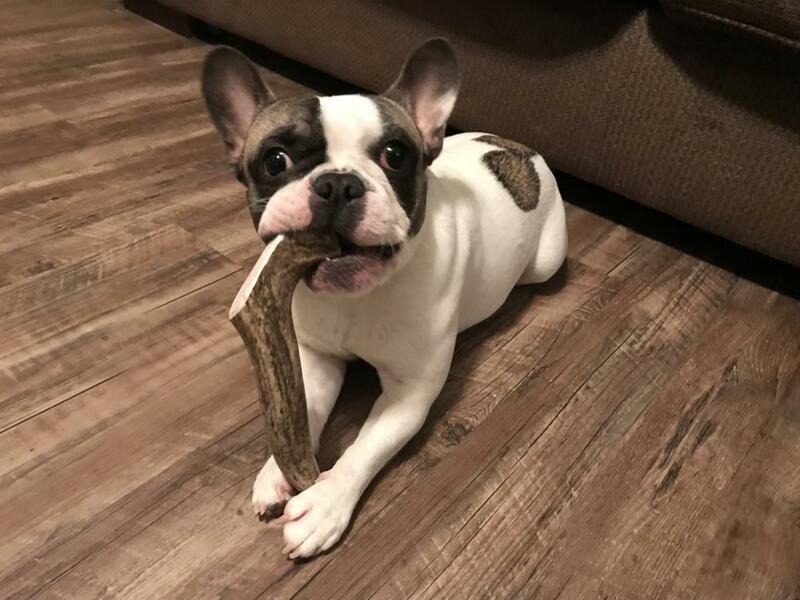 Our Premium Antler chews are 100% all natural, odor-free and very long lasting. These antler dog chews come right out of nature each spring shortly after the elk drops them, so they are completely unprocessed! Antler chews hold up longer than artificial or man-made treats of compacted starch & rawhide. Antlers contain many beneficial bio-nutrients and nothing artificial. Fresh antlers are nearly impossible chip or splinter when they are being chewed unlike processed bones, or other lesser quality antler chews. Your Dog's chewing action grinds the antler down very slowly. With elk antlers there is only one Ingredient, antlers are an annually renewable resource containing no artificial or added Hormones, Antibiotics, Animal By-Products, Steroids or Preservatives. 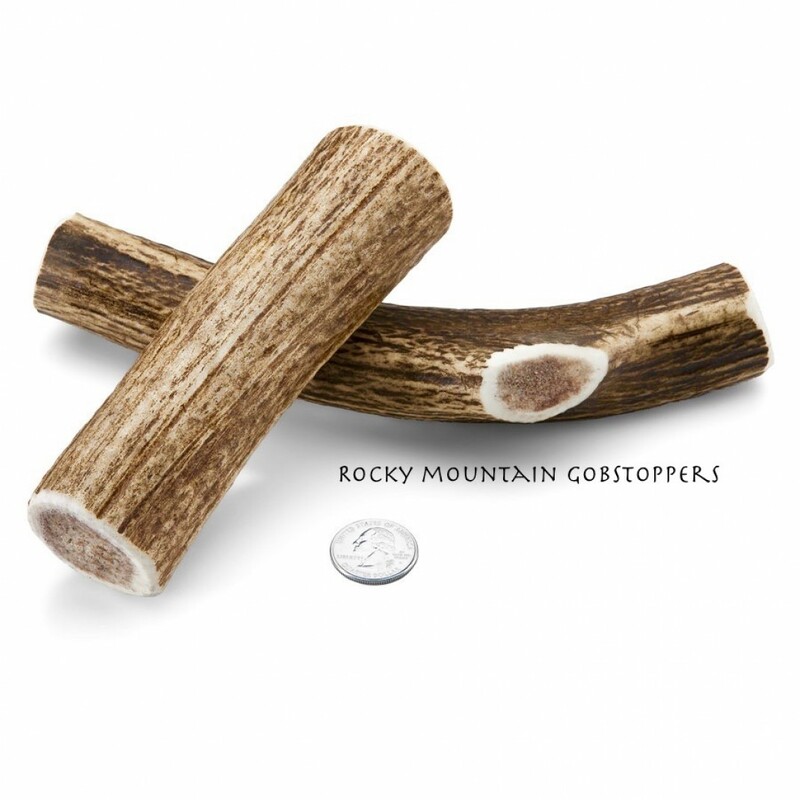 MEDIUM-WHOLE Rocky Mountain Gobstoppers are Premium Antler Chews cut from high quality, naturally shed Grade-A Elk antlers and typically weigh an average of approx. 6.5 ounces each. PLEASE SHOP AROUND AND COMPARE PRICES! Our by the pound price is fair, if you do your homework you will see a much better value as compared to retailers offering individual antler chews. Please help us spread the word! Get more antler for your buck with our Premium Elk Antler Dog Chews! This is my third time ordering and I stocked up this time with 3lbs to get the free shipping. My French bulldog gets bored very easily and becomes super destructive. Antlers are the only thing that can keep him entertained for longer than 5 minutes. These are much better quality then the ones in the pet store. I highly recommend. My goldendoodles love these whole elk antlers. And ElkAntlerDogChews.com offers great wholesale pricing to keep costs low. Ordering is fast and efficient, and they arrive quickly. Allie and Cooper will be back for more! Our mixed breed rescue Sammy is 11 months old and will chew up anything from a stuffed toy to a steel toed boot. He loves these antlers. Their sturdy which means he can chew for hours and make little progress, they're all natural so we can let him chew without worrying about what he consumes; and he finds the flavor to be satisfying. He was very happy when we opened the box and he saw the antlers. From the human perspective, these items are quality, strong, natural and something I feel good about giving to my boys to assist in their desire to chew. I highly recommend them.